The classic park strategy is to base yourself at or near one of the lodges. Each presents a different face of the park: Lake McDonald’s lower, greener west side; the high peaks around Many Glacier; and the prairie-infuenced East Glacier side. Most hotels are open seasonally, generally from May through October. Ask about discounts for shoulder season (June, October). For reservations or information on in-park lodging, contact Glacier Park, Inc. (406/892-2525 or ). Glacier Park Lodge & Resort. Built in 1912, Glacier Park Lodge & Resort is nestled in East Glacier at the foot of Dancing Lady Mountain. With a swimming pool, nine-hole golf course, day spa, lounge, fine dining restaurant, eclectic gift shop and its close proximity to Glacier National Park, this 161-room lodge is a wonderful Montana destination. 214 rooms; $$-$$$$. Lake McDonald Lodge. Like the lake it sits on, Lake McDonald Lodge is lovely in a cozy, approachable way. Sitting on the porch here, drinking in the sunset, is an essential Glacier experience. And the lodge’s evening programs, run by the park staff, will get you charged up about Glacier’s geology and Native American history. 100 rooms in lodge, cottages and motor inn. $$. Many Glacier Hotel. The 99-year-old Many Glacier Hotel may have the most beautiful setting of any hotel in a national park with stunning views of Swiftcurrent Lake and the Rockies. It looks like a Swiss chalet on steroids: The five-story lodge needs to be big to stand up to nature’s towering architecture. The hotel sits on the shores of Swiftcurrent Lake; two short boat-rides take you to the trail for Grinnell Glacier, among the most accessible of the ice fields that give the park its name. Many Glacier even has its own ranger-led tours. 214 rooms; $$-$$$$. Rising Sun Motor Inn. Located seven miles from the east gate at St. Mary’s, this lakeside inn has stunning views of Lake McDonald. 72 rooms; $$. 406/892-2525 or . Swift Current Motor Inn. Located on the upper east side 88 rooms; $-$$. 406/892-2525 or . Village Inn at Apgar. Just outside the western entrance, this motel is no-frills, but has affordable prices and clean rooms. 36 rooms; $$-$$$. 406/888-5484 or . Built by the Great Northern Railway in the early 1900s, Glacier National Park’s chalets offered wilderness lodging that was comfortable and stylish. Granite Park Chalet. Heidi would feel at home at this Swiss-style chalet perched 6,600 feet above the Continental Divide. Hiking distance to the chalet ranges from 4 steep miles to 7.6 miles, so it’s work to get there, but you are rewarded with majestic backcountry views. There are 12 rooms that hold two to six people each. You pack in your own food and water. $-$$. 888/345-2649 or . Sperry Chalet. The 1913 Sperry Chalet is a full-service lodge. The stone buildings (the main lodge, dining room, and rest rooms) lack electricity, but propane lamps lend a romantic aura to the lace-curtained dining room. The 17-room chalet has sweeping vistas of Lake McDonald. Dinners here are simple but deliciously hearty. Visitors reach the chalet by hiking the steep 6.7-mile Sperry Trail from the Lake McDonald Trail. Want a lift? You can ride horseback to Sperry with Mule Shoe Outfitters. $-$$. 888/345-2649 or . Belton Chalet. In West Glacier, there’s the handsomely restored 1910 Belton Chalet; from $110; 888/235-8665 or . Izaak Walton Inn. An unusually charming B&B on the southern boundary off U.S. 2, halfway between the east and west gates. Amtrak even stops at the front door of this 1939 building, originally used to house railway workers charged with keeping the lines clear in winter. In keeping with the railroad-theme, there are both rooms and cabooses. 43 rooms, cabins and cottages; $$-$$$. 406/888-5700 or . Glaciers Mountain Resort. 5 cabins; $$$. ; 1-877-213-8001. Prince of Wales Hotel. 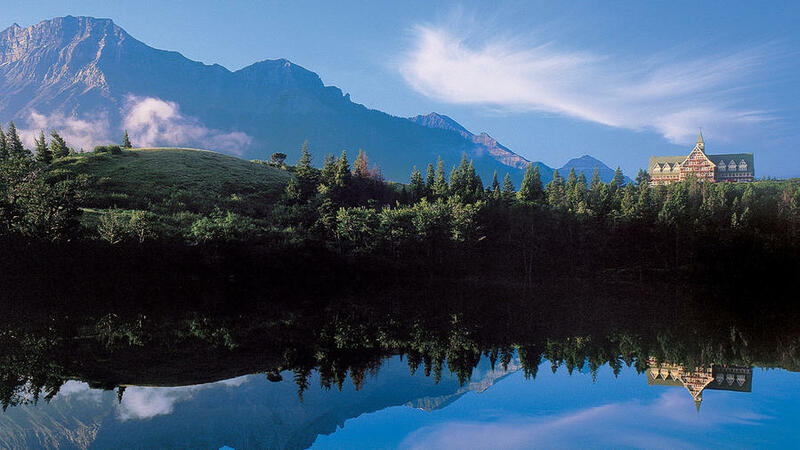 If you are able to spare the time an added bonus can be to visit the Canadian side of the lovely Waterton Lakes National Park in Canada, the sister park to Glacier. Built between 1926-1927, the stately hotel is located in Waterton Lakes National Park in Alberta overlooking the picturesque Upper Waterton Lake and the township of Waterton. $$$. 406/892-2525 or . Phone 406-892-2525 for more information on all these restaurants. Glacier Park Lodge. The Great Northern Dining Room is a classic; the Empire Bar & Grill more intimate. Lake McDonald Lodge. Russell’s Fireside Dining Room is hunting lodge rustic; the adjacent Stockade Lounge a good place for a beer. Courtesy of Glacier Park, Inc. Many Glacier Hotel. The Ptarmigan Dining Room has a phenomenal view of the mountains. Johnson’s of St. Mary. 406/732-4207 or . Open April-September.